5 spicy, red jalapeño peppers stuffed with mixed cheese and fried golden. Served with sour cream and salsa. Fries piled high and topped with loads of cheese and gravy. Fries topped with cheese and Texas chili with a side of sour cream and green onions. Fries topped with real Quebec cheese curds and our house smoked Montreal smoked meat and smothered in house gravy. 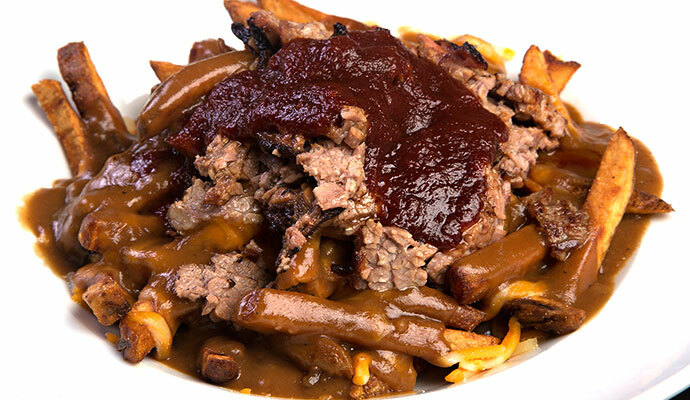 Our classic poutine topped with your choice of pulled pork, pulled chicken or chopped brisket and our house Sweet and Tangy BBQ sauce. 7 tender catfish fingers soaked in buttermilk and cajun spice, then cornmeal dusted and fried. Served with chipotle and lime dip. 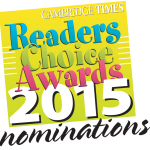 Choice of pulled pork, smoked chicken or brisket with diced peppers, onions and mixed cheese finished with BBQ sauce. Served with salsa & sour cream. Local jumbo roaster wings smoked then fried crisp and tossed in your choice of BBQ, medium, hot, suicide, honey garlic, fire & ice, butter Cajun or Caribbean jerk. Choice of dressing: Buttermilk Ranch, Blue Cheese, Italian, French, Greek and Balsamic. Tender greens, tomatoes, shredded carrots, cucumbers and red onions. Served with your choice of dressing. Tender greens topped with diced tomtatoes, onions, mixed cheese, smoked chicken, bacon, guacamole and egg. Tender greens topped with diced tomatoes, red onion, red/green peppers, cucumbers, feta cheese, guacamole & our house made tequila lime chicken. Baby romaine greens, house made bacon bits, garlic croutons and creamy garlic parmesan dressing. Tender greens topped with diced tomatoes, red onions, red & green peppers, shredded cheese and your choice of smoked pulled chicken or smokehouse chili. Served with sour cream & salsa on the side. Served with slaw and choice of side. 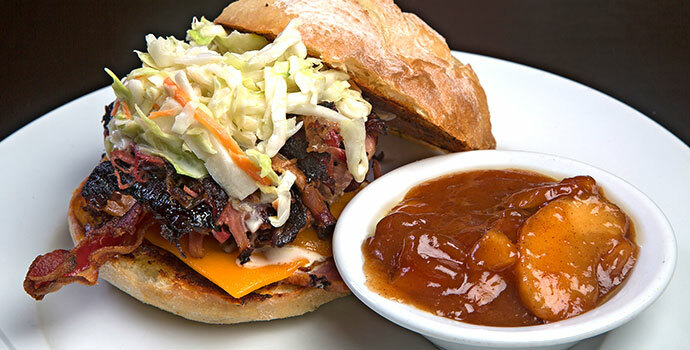 Our hand sliced to order brisket topped with grilled peppers, onions, mushrooms and Swiss cheese on a focaccia bun. A trio of pulled pork, peameal and crisp bacon topped with caramelized onions, melted cheese and house made slaw on a toasted bianco roll. A classic combination of wine sauerkraut, Swiss cheese, Russian dressing and our smoked brisket, grilled between 2 pieces of rye bread. Pulled chicken topped with Carolina mustard, lettuce, tomato, bacon, Swiss cheese and crispy onion rings on a toasted bianco roll. Tequila & lime encrusted grilled chicken breast stacked on chipotle lime aioli, lettuce, tomato, bacon and topped with guacamole & feta. 6oz AAA rib eye grilled to your liking and topped with caramelized onions. Served on a toasted rosemary focaccia roll. An original recipe since 1928. House cured, smoked and served on rye bread with mustard. Pulled pork, jalapeño poppers, guacamole, caramelized onions, baked beans and mixed cheeses wrapped in a warm flour tortilla. Classic Caesar salad and smoked chicken rolled in a flour tortilla. The classic diner sandwich done the Q way – smoked chicken, bacon, tomato, lettuce and cheddar cheese, finished with Cajun aioli. Dress your Q dog with pulled pork & slaw or Texas chili & cheese. Hand pulled and piled high on a toasted bianco roll. Sliced and piled high on a toasted bianco roll. Tender smoked chicken stacked high and served on a toasted bianco roll. All burgers are 6 oz. of Ontario fresh ground prime rib and hand pressed. Dressed with lettuce, tomato, onion and pickles. Served with coleslaw and choice of side. Plain and simple, grilled to perfection. Our original topped with bacon and cheese. Our original topped with pulled pork and house made slaw. Our original topped with chili and cheese. Our original topped with sautéed mushrooms and Swiss cheese. 2 patties piled on a bun and topped with lettuce, tomato, onion and chipotle lime aioli. Original topped with cheese, bacon, fried egg and guacamole. Local Ontario pork rubbed down and smoked for 14 hours. 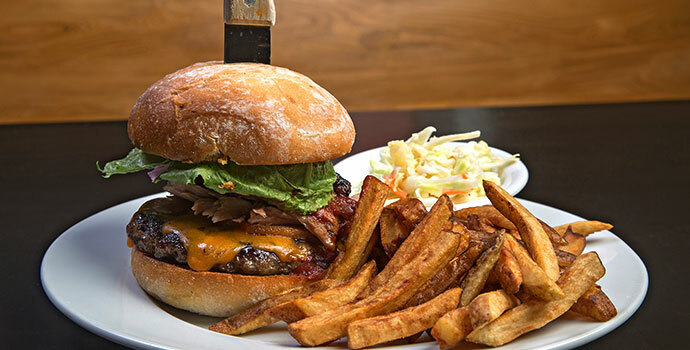 Tender juicy, smoky and piled high on a buttery roll. Smoked low and slow. Flame kissed and brushed with our original BBQ sauce. 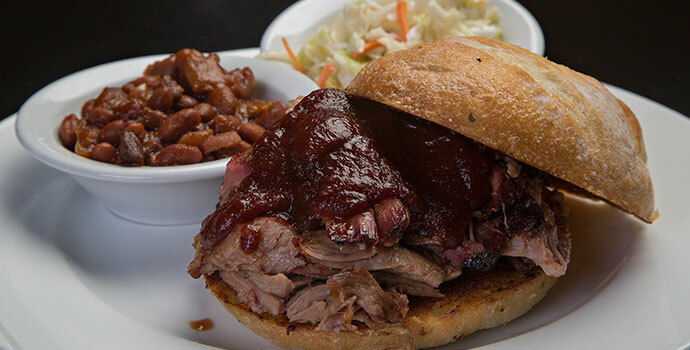 House made, spiced to perfection and served with our original BBQ sauce. Fresh Canadian AAA beef brisket rubbed down in our signature rub and smoked for 12 hours. Sliced to order and piled high on a butter roll. Rubbed down in our signature rub, smoked for four hours, then flame kissed and brushed in our original Texas style Sweet and Tangy house BBQ sauce. Two centre cut 5oz chops, smoked, flame kissed and brushed with BBQ sauce. Served with cinnamon whisky apples & choice of 2 sides. A pound of JUMBO roaster wings tossed in our house rub and smoked slow until tender. Have them naked or tossed in your choice of Mild, Medium, Hot, Suicide, BBQ, Honey Garlic, Fire & Ice, Butter Cajun or Caribbean Jerk. 5 crispy tenders served with your choice of dipping sauce and your choice of 2 sides. 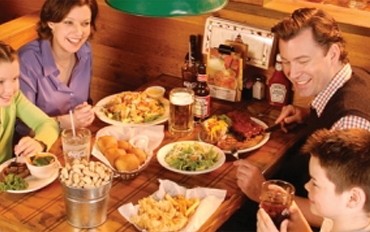 AAA center cut steak grilled to your liking, served with choice of 2 sides and cornbread. 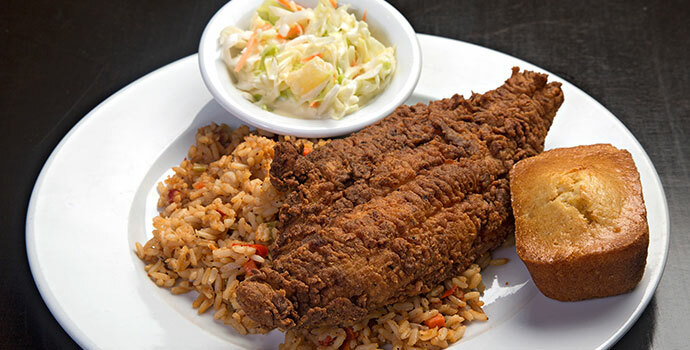 2 tequila & lime encrusted chicken breasts served on a bed of Cajun Creole rice with your choice of side. Straight from the south. Tender chicken, smoked sausage and shrimp nished in a tomato based creole sauce with peppers, onions, mushrooms and served on a bed of Cajun creole rice. 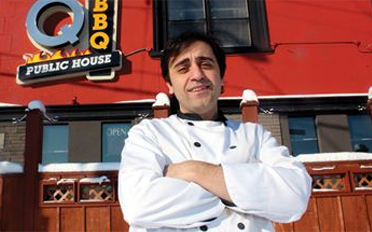 Ribs, Brisket, Pulled Pork, Smoked Chicken, Smoked Meatloaf, Smoked Peameal, Smoked Sausage, Smoked Pork Chop or Smoked Wings. No additional charge on doubling up on Pulled Pork. Doubling up on all other meats will result in additional charges. Don’t forget about our BBQ Platters! Perfect for sharing, sampling, or accommodating a family, our platters let you enjoy all our BBQ delights at once! Our chefs can customize a menu to fit your needs for any type of event, big or small.